← How Do We Assess Efficiency? Or Do We? 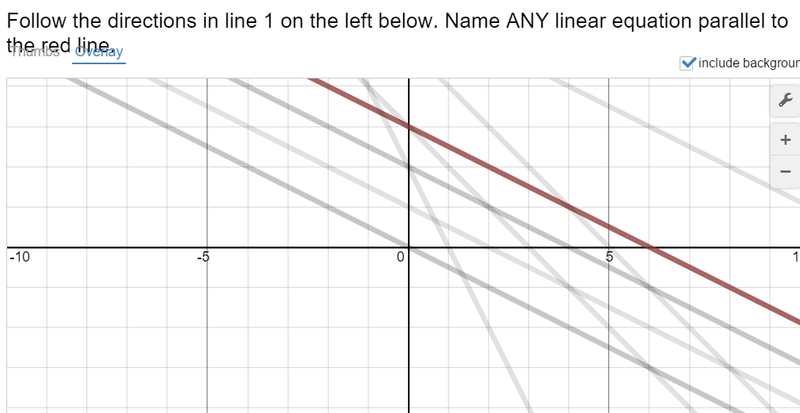 This past summer, our forward-thinking math-teacher-centric friends at Desmos released Activity Builder into the wild, and the collective creativity of the math world has been evident as teachers work to find exciting classroom uses for the new interface. Many of these activities are now searchable at teacher.desmos.com – you’re welcome to leave now and check them out – but come back…please? Its easy to get sucked in to a new, shiny tech tool and want to jump in headfirst with a class. I’ve now created a few lessons and tried them with classes which range from the “top” in achievement, to my freshmen Algebra 1 students. In both cases, I’ve settled upon a set of guiding principles which drive how I build a lesson. What path do I want them to take to get there? How will my lesson encourage proper usage of math vocabulary? What will I do with the data I collect? It’s the last question which I often come back to. If making a lesson using Activity Builder (or incorporating any technology, for that matter) doesn’t improve my existing lesson, then why am I doing it? @bobloch Great stuff. Maybe don't mix the parallel with the perpendicular in the beginning. @bobloch Nice! I wasn't sure what you wanted on slide 12, and on 16 I was expecting you to ask for perpendicular, rather than parallel. The class I tried this with is not always the most persistent when it comes to math tasks, but I was mostly pleased with their effort. Certainly, the active nature of the activity trumped my usual “here are bunch of lines to draw – I sure hope they find some parallel ones” lesson. What’s going on here? A mis-type of the slope? The students were quite helpful towards each other, and if nothing else I’m thrilled the small group conversation yielded productive ideas in a non-threatening manner – it’s OK to make errors, we just strive to move on and be great next time. The mantra “parallel lines have the same slope” quickly became embedded. So, before we even talk about opposite reciprocal slopes, we seem to have a conceptual misunderstanding of perpendicular lines. I’m glad this came up during the activity and not later after much disconnected practice had taken place. In retrospect, I wish I had put this discussion away for the day and come up with a good activity for the next day to make sure were all on board with what perpendicular lines even look like, but I pressed ahead. We did find one student who could successfully generate a pair of perpendicular lines, and I know Alexys enjoyed her moment in the sun. What guiding principles guide you as you build activities using technology? How do they shape what you do? I’m eager to hear your ideas! This entry was posted in Algebra, High School, Technology. Bookmark the permalink. Bob, I saving this and am going to use it in class this semester as I teach students how to use technology in the classroom. They will be building a lesson, so this post will come in very useful to them. I hope you don’t mind! Don’t mind at all. Think we all need to create our person or global checklist when working with technology. Feel free to share. Bob, this is exactly where my head is as I use the activity builder more and more. I know it has huge potential as a game-changer, and I want to make sure I’m getting the most out of it. I’ve been listing posts about this in fact! So far, my best practices, some of which came from that list, are: to keep the number of slides VERY low, like 5-6, so that there’s a high probability everyone will finish it during the class. Second, make sure there’s one question slide for every 1-2 graph slides, so everyone can see what everyone else is thinking as they move through the activity. Third – have at least one open-ended question eg what do you notice/wonder, where there’s no one right answer. Fourth – gather everyone together every now and then to talk about the results/responses/ideas, or to show the overlay. I want it to feel like we’re learning together, not in isolated silos. 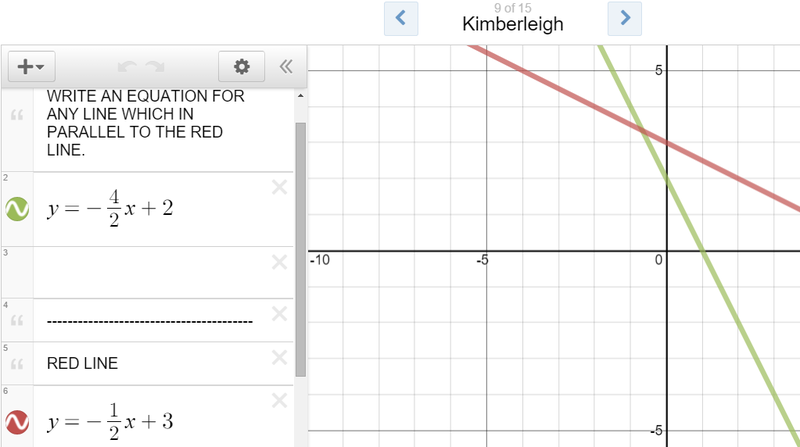 Fifth – if it ends up taking more than the class, do a followup next day with snapshots of all answers/sample graphs etc. Bob, thanks for sharing your guiding questions when using technology. Related to your last question regarding the usual delivery, I often ask: How will technology give students learning experiences that they couldn’t have had without the tech? This forces me to think more critically about the technology as a tool to work the kind of thinking and reasoning I want my students to do. And the answers to this question influence how I set up the activity: 1) it provides immediate and dynamic feedback (i.e., real-time graph changes), 2) it provides opportunities for higher levels of generalization, 3) it provides a laser-like focus on student thinking. Thanks for sharing your thoughts. One additional obstacle I encounter with building tech-based activities is this students are not accustomed to being ask to learn through a technology journey. It’s important to include reflective opportunities for students to communicate what they have learned as they progress and think about how the tasks they are asked to complete fit into the progression. I enjoy creating lessons using Activity Builder. Here’s my general flow: interaction slide or 2, reflection slide, small or whole group discussion, repeat.